Piotr M. Kaczynski works for the Centre for European Policy Studies (CEPS), a think tank which claims “high standards of academic excellence” through “quality research”. Roughly a third of its funding comes from EU institutions and national governments, and one of its main research areas is climate change (it gave a number of presentations at Copenhagen). 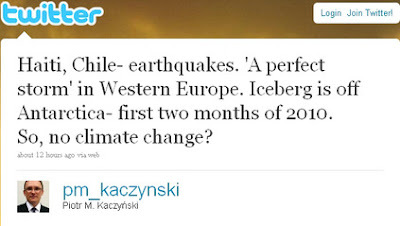 And one of its leading “thinkers” believes that the earthquakes in Haiti and Chile were caused by climate change. But remember, it’s the sceptics who need educating. Update. Piotr responds in the comments – unconvincingly but (and please note) very politely. Unbelievable. Such woolly thinking pervades the whole of western society. Should be sacked. ‘global warming with Mr. Jones of East Anglia, and the BBC’s one-track, Ms. Watts. And are we to assume that there have never been big storms in Europe before the 20th century? Some dopey cow on Radio 5 just claimed the storm that went across France was due to climate change. These mongs just never stop do they? The stunning ignorance is easily explained when you consider the funding source and the fact that these people have a vested interest in peddling the global warming fraud, their jobs depend on hawking their masters lies. Here you have found a perfect example the symbiotic relationship between the funding entity and the person who relies on the funding for their livlihood. Its also a perfect example of why the global warming fraud was bound to fail, the choice of employing ignorant obedient nodding head lackys to enable the political fraud. We laugh at their stupidity and hilarious as it is to witness thye have milked countless millions from US all and actually stopped real scientists from receiving proper funding for real research. Now we know where the BBC fools get their reports from? Next we know they will be offering sacrifices to Poseidon the Earthshaker. Marcus Brigstocke wouldn’t be much missed, Mind you I don’t think Poseidon would be very pleased with the offering. I’ve sent him an email to tell him about his new found fame …..
1. I am not specialising in climate change research, but in EU institutions and politics, so please treat this twit as a personal comment rather then a researcher’s result of research. 2. I have included earthquakes not because they are any direct result of climate change, but because they can cause climate change with the amount of emmissions of various gases, etc (not to mention human costs in Haiti)! So climate is changing and humans are not the only cause of it, but they also contibute to the change! Since when did earthquakes emit gases ? Why not stay away from climate matters, you are obviously ignorant and just parroting the Warmist line that everything a one big climate-change catastrophe. Technically there is a possibility that an earthquake in certain locations can release some methane trapped under the seabed. However, methane isn’t the nasty CO2 that the Warmists are screaming about. So Mr. Kaczyński has made a false connection there, which is what I think Scott N meant. You appear to have deliberately mixed-up alleged symptoms and causes there old chap? Piotr – thanks for replying – I don’t agree with your theory but at least you took the time to explain it. I, alone with others, may have cause to question some of your claims, but admire that you have taken the time and trouble to enter this forum to articulate your reasoning. With luck the replies in response, as most so far, will match your measured tones, but please do not presume that if there are ‘extremes’ it means much beyond the inevitable of free posting and debate on blogs. I am sure you appreciate how these things work. Unlike some, closer to home, on other threads who, having been alerted to views counter to their own, have decided to venture briefly from their tribal comfort zones to re-educate ‘the masses’, not with the power of their argument, but cliched insults and hissy fits. And seem surprised that their ‘obvious’ superiority of thought is not appreciated as articulated, and fully deserving of robust responses. That you have appreciated such overly defensive approaches seldom achieves much reflects well. Your area of expertise is socio political in nature and that is the problem isnt it? Your role is to peddle a political message using fraudulant and partisan ‘research’ and using vast amounts of taxpayers money to do it. Your entire funding stream relies on the man made global warming theory, the political nature of which demands massive social changes within society. In fact your organisation is using the so called evidence of man made global warming to hide the real agenda which is socio political engineering, these changes would be roundly rejected if they were presented to the population so you attempt to hide the real agenda behind a fake facade. If you were truly confident of your position you would include a sceptical view in your output, the fact that you actively suppress and belittle and smear and ignore any opinion that contradicts your prejudice can only show your true intentions. Your organisation is damaging real science immensely and the damage is hurting real people, I urge you to invite sceptics to review and contribute to your organisation. Mr Kcyznski, Cassie is a BNP Zionist. You’ll have to excuse her stentorian presumptions. My word hippipooter you forgot the foam flecked rage add on! You are, are you not, a Zionist; and you do, do you not, support the BNP? Who was it who said That even the flutter of a butterfly’s wings can cause a hurricane on the otherside of the world? So if everything, so matter how small, can effect climate it is not too big a jump to suggest a major earthquake has some climate consequences. With that I say so what? There have always been earthquakes from the beginning of time and climates has always been changing. Even if we accept the Warmist claim that the Earth is heating up I don’t recall any one factoring in earthquakes and tsunami consequent on earthquakes in their computer models. Thanks for clarifying Mr Kaczynski. If it is the case that your thinktank advocates Global Warming theory, one has to imagine you base your belief in it to a large degree on your own thinktank’s position? Would you say that you are aware of the Sceptic’s case against global warming? .. And, I think it ha to be asked, does your view have anything to do with BBC coverage of the issue? I clicked on Piotr’s home page and then clicked on “CV” where it said “coming soon ” ! I think we can safely say he has no background in science and his views are as irrelevant as Al Gore’s. Just another EU lackey with his snout in the trough. I suggest you check out the website WattsUpWithThat.com, read back over the last couple of weeks’ posts. Mostly by scientists. That will give you a better idea of how the sceptical view is founded in good science – and how the Warmists have been damaging the integrity of science by their refusal to allow full transparency of data and the methods by which they select (cherrypick) data and then manipulate it. Why not focus in on the Hockey Stick – the fraudulent attempt over decades by the Warmists to suggest that the historically-factual Medieval Warming Period was nothing in particular – so that they could argue that recent (manipulated) temperature trends are unprecedented. The website is riddled with the usual leftist EU gravy train nonsense.